Rooftop chimneys, Casa Batllo, Passeig de Gracia, Barcelona, Spain. For more photos of Gaudi's architectural gems, check back this weekend. Curved chimneys and ventilation ducts on the rooftop terrace at Casa Batllo. Four chimneys, decorated in glazed ceramic tile. Rooftop photo, Casa Batllo, Passeig de Gracia, Barcelona, Spain. I am back from Barcelona, with about 600 photos of amazing art and architecture, including Antoni Gaudi's Modernism and Art Nouveau marvels. And I still haven't had a chance to tell you about my trip to Antwerp! Check back later for more photos and travel adventures. "We are pleased to announce that Paris Parfait was selected to be featured in the Women, Power and Politics online exhibition at the International Museum of Women. Her recent posts about U.S. Vice Presidential candidate Sarah Palin were included in a story with other women bloggers from around the world who are discussing Palin. View the story here: http://www.imow.org/wpp/stories/viewStory?storyId=1698." Women, Power and Politics is a multi-media, global online exhibition available in Arabic, English, French and Spanish. From March 8 to December 31, 2008, the exhibition focuses on a provocative new topic each month and features submissions from artists, activists and organizations doing work related to exhibition topics. You can get involved in Women, Power and Politics by reading the exhibition stories, signing up for a profile in the community, participating in a conversation, submitting your work to an exhibition topic, or taking a recommended action to support women's political participation around the world. Start exploring the exhibition at www.imow.org/wpp. The Aga Khan's three-year-old horse Zarkava has become the first filly to win the Prix de l'Arc de Triomphe at Longchamp since 1993. 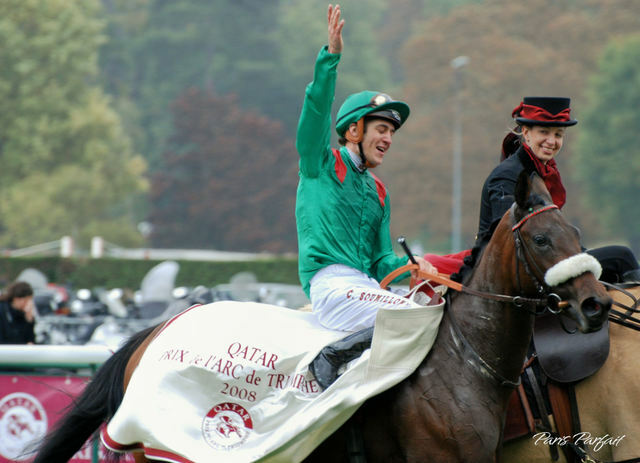 Top French jockey Christophe Soumilion rode Zarkava to victory late Sunday afternoon in a thrilling race, despite the damp weather. Christophe Soumillion and the Irish horse Zarkava post-victory at Europe's most famous flat-race. 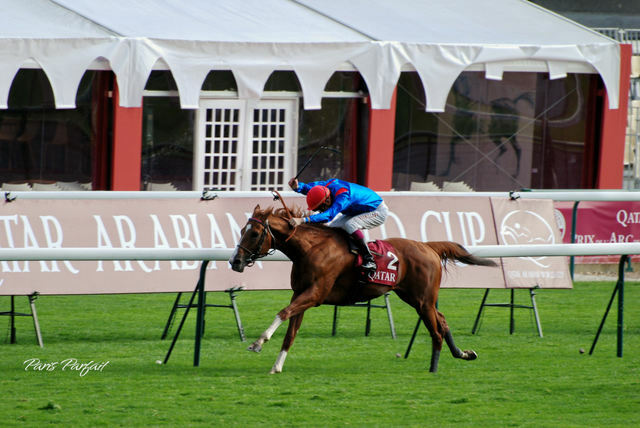 The winning purse for the Arc totaled four million euros. 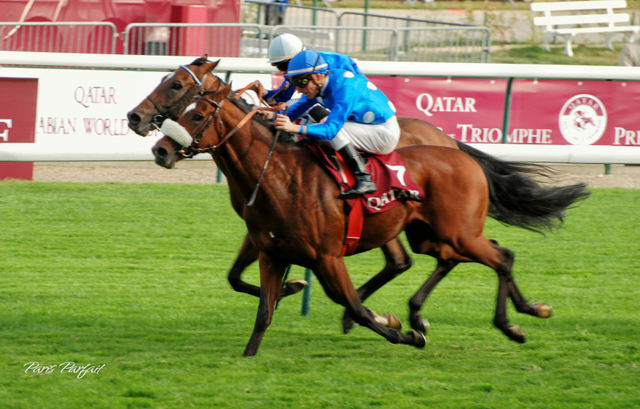 The Irish horse Youmzain finished second, in a repeat performance of the 2007 Arc. Check back later for more photos of the Arc festivities. Neck and neck in the Qatar Prix du Cadran at Hippodrome De Longchamp, Paris. The Group I race is 20 furlongs, the longest flat race in France. Eleven horses ran the course in the Prix du Cadran. French jockey Christophe Soumilion pulls ahead on the Spanish owned-and-trained horse Bannaby to win the race Saturday afternoon. 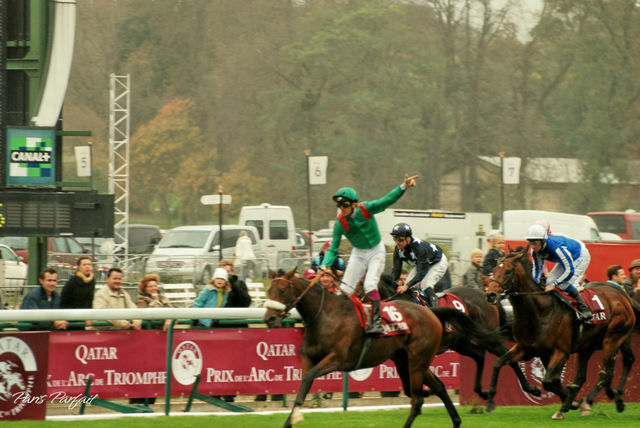 On Sunday, the annual Arc events culminate with the Prix de l'Arc de Triomphe race. The Aga Khan-bred three-year-old filly Zarkava is the punters' favourite. Urban Sea in 1993 was the last filly to win the race. Other strong contenders are Youmzain, Soldier of Fortune, Duke of Marmelade and Schiaparelli. 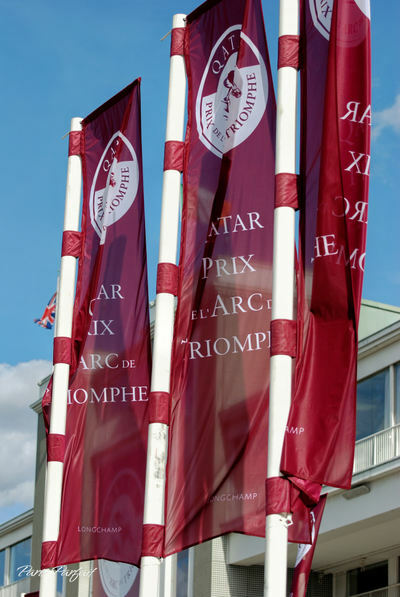 Silk banners for the Qatar Prix de l'Arc de Triomphe festivities, now underway at Hippodrome de Longchamp, Paris. Sunday is also the day ladies attending the races will be wearing stylish hats. I bought an Italian hat in San Francisco, intending to wear it to the Arc. But on Friday in Antwerp, Belgium, my friend Di Mackey and I stumbled upon a tiny little shop full of unusual hats, all created by a Dutch designer. Di said my face lit up when I tried on the third hat. I just remember laughing, when looking in the mirror. Because it is the kind of hat that makes a bold statement. It definitely trumped the original hat I'd intended to wear. And I'm pretty sure it can hold its own among all those stylish French chapeaux. Now if only the weather will cooperate! Rain is forecast.